Hello there, this is F1 Circuits Past and Present, a mini series brought to you by Sidepodcast. We’re looking at tracks that have hosted Formula One races at some point in its vast history, and today we’re zooming in on a relatively new one. It’s time to take a closer look at Abu Dhabi. It’s fair to say that some of the newer F1 races to be added to the calendar haven’t delivered quite as much excitement and verve as the organisers might have hoped. Occasionally, it takes a race a while to bed in, but mostly, it’s because the tracks just don’t have what it takes to deliver the kind of race that your average Formula One fan expects. Circuit designers, usually Hermann Tilke and his company, have to work with what they’ve got in the given area and in Abu Dhabi, they were faced with a flat expanse of land in the desert. Elevation changes were going to be impossible, so they had to look elsewhere for their kicks. The track, built for the 2009 Formula One season, is situated on Yas Island, one of a collection of sandy islands about ten miles to the east of Abu Dhabi itself. The layout of the track has a whopping twenty-one corners, winding around the marina and harbour, past a purpose built hotel, and taking in the traditional long straights ending in a hairpin. The hotel, actually, was one of the highlights of the circuit design when it first launched, as it was lit up at nighttime, and changed colour across the course of an evening. It also featured the gimmick first seen at the Singapore Marina Bay track, where the tarmac goes underneath existing infrastructure – in this case a bridge adjoining the hotel, giving fans a unique view of the cars disappearing beneath their feet. That wasn’t the only trick Abu Dhabi borrowed from Singapore. They fell short of going for the full night race, but opted to host a twilight race instead, with the local start time at 5pm. That meant drivers would start racing in the daytime, but gradually the night would fall and the floodlighting would take over. The chequered flag would be taken under lights with full darkness having fallen. The track presents some unique visuals, with the aforementioned colour-changing hotel, plus the bright blue run off paints, and the juxtaposition of tarmac against sand. However, one of the more stark views is the bright red, sprawling Ferrari World building. The world’s only indoor Ferrari theme park, attractions include museum, memorabilia and film pieces, some junior karting and F1 simulator opportunities and a car-based rollercoaster. The roof, that bright shade of Ferrari red, also features the largest prancing horse logo, measuring 65 metres across. So far, the circuit hasn’t been particularly popular with drivers or fans, producing mundane racing and only benefitting from the excitement that comes towards the end of a Formula One season – it has hosted the championship finale a couple of times over the past few years. One of the biggest concerns about the design of the Yas Marina track is the pit lane, specifically the pit exit. Cars leaving the pit lane dip down and underneath the track above, with a tunnel leading them through and out to rejoin the racing line on the opposite side of the track. We haven’t seen any particular incidents yet, but the narrow tunnel exit is considered a safety concern, in case of accident or fire. In an attempt to create more interest in Abu Dhabi, for the final race of the 2014 season, the FIA decreed double points would be available. That caused quite the debate amongst fans and media alike, and was ultimately for nothing. The double points didn’t affect the outcome of the title battle between Nico Rosberg and Lewis Hamilton, and the rule was quietly dropped for the upcoming 2015 season. Abu Dhabi needs something to make it more interesting, but a theme park, a night race and a double point debacle are not what is required. 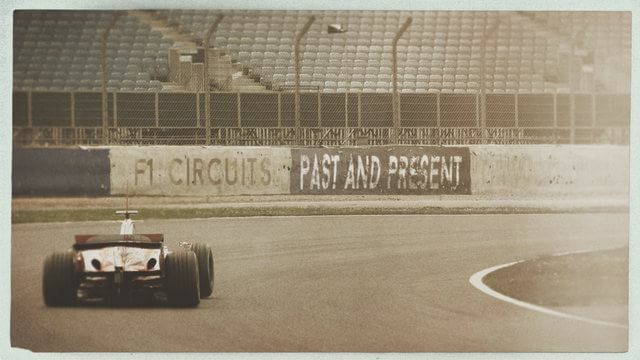 That’s all for this second episode of F1 Circuits Past and Present. If you’re interested in some of the things the sport has done to improve safety, rather than introducing tricky pit exit tunnels, do check out the F1 Safety mini series that features the car, helmets and clothing, the accident process and much more. And don’t forget to join me again tomorrow for a closer look at another F1 circuit.